Our supplier has been producing these exclusive eternal lights for four generations. 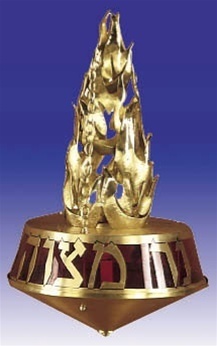 The majestic Yehudah eternal light is our most spectacular model. Molded out of polished brass, the light shimmers through the multi tiered brass flame. The outer edge has the Hebrew words cut out "The Light of G-d is the soul of man". The Ner Tamid is electrified with hanging chain. Uses standard Edison bulbs.